Birth: He was born at Madina in the year 212 A.H.
Martyrdom: He died of poison in 254 A.H. at Samarrah (Sarmanra) in Iraq and is buried there. Imam Ali un Naqi (a.s.)’s mother was a very pious lady who spent her whole life fasting. The 10th Imam has said that his mother was one of the ladies of paradise and one of those from ‘Ahlul Haqq’ (people of truth). “I am the student and he is the teacher. I now know what knowledge is. What I say is because of what I have been taught by Imam”. The Khalifa’s plan had failed yet again. Imam Ali un Naqi (as) served the longest period of Imamate (besides the 12th Imam) – 34 years which can be divided into two parts – 17 years of freedom and 17 years under arrest. In 234 A.H. came one of the most tyrannical rulers of the Abbasid Khilafate – Mutawakkil. He ruled with tyranny, killing, looting and terrorising especially those who were the followers of Ahlulbayt. Mutawakkil is also the one who ordered the desecration of the grave of Imam Husayn (a.s.) wanting to remove Imam’s body and burn it (He did not succeed). He tried running water over the grave so no traces of the grave would remain but was unsuccessful. He ordered that all those wanting to visit Kerbala would have their fingers cut off, then hand and feet cut then only be able to go if one other from the family was killed. Imam still asked Shias to visit Kerbala. When Mutawakkil saw that all had failed and it did not discourage the visits than he banned all visits to Kerbala completely. Mutawakkil called Imam to Samarra. Imam was called under the pretext of respect and love towards him. Imam was aware of Mutawakkil’s intentions but went knowing that this would be an opportunity to show the Turks too what true Islam was. On arriving in Samarra the Turkish spies sent with Imam were amazed at Imam’s knowledge of the Turkish language when he had never visited the Turks before. It was an opportunity for Imam to prepare the Mu’mineen in Samarra for ghaibat. Imam was put up in an Inn which was meant for beggars, destitute and criminals. From this Inn he was removed and put into the custody of an evil man called Zarraqui (who changed to be an avid supporter of Imam) and then a man called Seyyid. “I have heard that there is a chapter of a divinely revealed book which does not contain the letters ( t d k S X ) and if this chapter is recited it grants the reciter paradise! I would like to know which chapter and in which book and why these letters are not present”. Mutawakkil’s ‘Ulema’ were confused and eventually Mutawakkil turned to Imam. Imam told him that the chapter was Suratul Fatiha in the Qur’an and the above letters were not present because it was a chapter of mercy and each of the above letters represented words of Adhab (punishment) or Ghadhab (anger of Allah). Mutawakkil seeing that he could not humiliate Imam in any way, he announced his arrival in Samarra as Ibnur Ridha (son of 8th Imam) and subjected him to things such as handing him a glass of wine in his hands in his court, asking him to sing, making him run in front of his (Mutawakkil’s) carriage..etc. Imam Hasan Al-Askery (a.s.) was placed under separate house arrest than his father at the young age of 5 years as Mutawakkil did not want the birth of the 12th Imam. Imam spent his life making the imminent ghaibat of the 12th Imam easier. Soon after, Mutawakkil was killed by his own son who could not withstand the behaviour of his father. After Mutawakkil’s death his son Muntasir was the successor and he lifted the restrictions of visiting Kerbala. His rule was unlike his father’s tyranny but remained in power for only 6 months and died at the age of 25 years. Then came Mustan Billah (Ahmed bin Mo’tasam) followed by Mo’taz Billah who continued his tyranny on Imam and his followers. The thirtythree years of imamate of Imam ‘Ali an-Naqi coincided with the caliphate of the following six caliphs Mu‘tasim bin Hârun, Wâthiq bin Mu‘tasim, Mutawakkil bin Mu‘tasim, Muntasir bin Mutawakkil, Musta‘in, and Mu‘tazz bin Mutawakkil. Wâthiq bin Mu‘tasim had a very promiscuous lifestyle, and had no time to harass the Shi‘as and the Imams of the Ahlul Bayt. During his caliphate, a large number of the descendants of Imam ‘Ali (a.s.) had settled in Samarra, the ‘Abbasid capital. But the peaceful days for the ‘Alids and the Imam did not last long. After Wâthiq, his brother Mutawakkil, came to power. Mutawakkil was the most cruel of all the ‘Abbasid caliphs; he is comparable to Yazîd bin Mu‘âwiyah of the Umayyads. Mutawakkil, on the one hand, started promoting the Shâfi‘i madhhab in order to distract the masses away from the Ahlul Bayt. And, on the other hand, he intensified harassment of the Shi‘as. He had such hatred for the Ahlul Bayt that in 236 A.H. he ordered the grave of Imam Husayn (a.s.) be leveled to the ground, and that the surrounding area be transformed into farmlands so that no trace of the grave be left. This all was done to stop the Shi‘as from visiting (ziyârat) the graves of Imam Husayn (a.s.) and the other martyrs of Karbala. But when Allâh wishes to protect His “light” no human can do anything about it! The attempt to erase all traces of Imam Husayn’s grave angered many Muslims; people starting writing anti-‘Abbâsid slogans on the walls. Opposition poets also expressed their feelings on this issue. A famous poem against Mutawakkil is given below: By Allâh, if the Umayyids unjustly killed Husayn, son of the Prophet’s daughter, his cousins have committed a similar crime for I swear that Husayn’s grave has been erased. It seems that they regret for not participating in the massacre, so they now go after the grave! Mutawakkil enjoyed torturing the followers of the Ahlul Bayt; even the persons appointed by him as governor in Medina and Mecca were instructed to prevent people from being kind and courteous towards the Ahlul Bayt. In 234 A.H., Mutawakkil ordered Imam ‘Ali an-Naqi (a.s.) to be brought from Medina to Samarra where he was placed in a house next to the caliph’s garrison. The Imam lived under constant surveillance until Mutawakkil was murdered by his own troops at the instigation of his own son, Muntasir. Muntasir bin Mutawakkil reversed the policies of his father towards the Ahlul Bayt (a.s.); he was kind and generous to them; he returned the property of Fadak to the descendants of Imams Hasan and Husayn (a.s.). Unfortunately his caliphate did not last for more than six months when he died in 248 A.H.
Musta‘in came to power after Muntasir and continued the oppressive policies of his ancestors. But soon his own Turkish troops rebelled against him and pledged allegiance to Mu‘tazz bin Mutawakkil whom they rescued from prison. Finally, Musta‘in was killed and Mu‘tazz become the caliph. 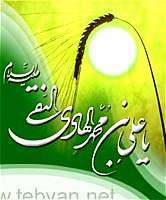 It was during the reign of Mu‘tazz bin Mutawakkil that Imam ‘Ali an-Naqi was martyred by poisoning. Mo’taz arranged for the poisoning of Imam through an ambassador and Imam was martyred on Monday 3rd Rajab 254 a.h. nobody except Imam Hasan Askery (a.s.) was present at the time of his death. he gave his father ghusl and kafan and wept bitterly. Imam Hasan Al-Askery (a.s.) the Eleventh Imam. Muhammad (known as Syed Muhammad – Tomb near tomb of Balad).